Spending the holiday season in Jamaica or the tropics seems like a happy Christmas in the sun. 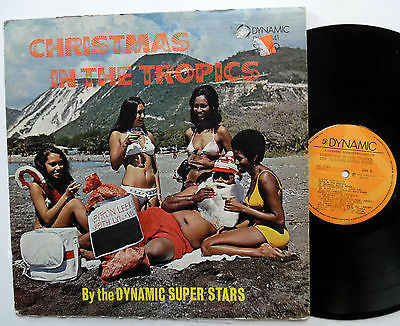 Recorded in 1972 as a 7 inch and released on the Jaguar label, “Happy Christmas” has been featured on many holiday compilations. Obscure Nigerian Christmas boogie reissued 2017 on the Duomo comp by Odion Livingstone. This two record set features Xmas Eve originally from O’ Bazz’s lyabor album. Francis Bebey’s song dramatization of a forest nativity scene. Originally released on Bebey’s amaya LP on Ozileka. Reissued on a Bebey sanza compilation on Born Bad Records. Formed in the 1970s, La Pandilla was a teen music group from Spain. La Pandilla was Spain’s answer to the Beatles and Beatlemania mimicking fan hysteria in product placement to market goods such as notebooks, posters, magazines and school supplies. Jingle Bells is from La Pandilla’s En Navidad album from 1976 on Alegria. Karin Stanek was a Polish beat singer who was popular in Poland in the 1960s. She emigrated to Germany in the 1970s where she started singing in German and English. Her holiday song, “Santa Hallelujah” is available on a compilation highlighting her life’s work Karin Stanek, Autostopem z Malowana Lala (Hitchhiking with a Painted Doll) on MTJ from 2011.